The Cosmic Microwave Background Radiation (CMBR) is interpreted by present-day physics as the echo of the Big Bang. It can be proved experimentally as microwave radiation that radiates uniformly in all directions of the sky, that is, it can't be attributed to any individual sources. And it has a temperature of 3 degrees Kelvin, that is nearly a thermal black body spectrum. The Cosmic Microwave Background Radiation was predicted in theory as consquence of the Big Bang by George Gamow, Ralph Alpher and Robert Herman. In 1964 Arno Penzias and Robert Woodrow Wilson were the first to measure it when they were working with their experiments at a large antenna project. 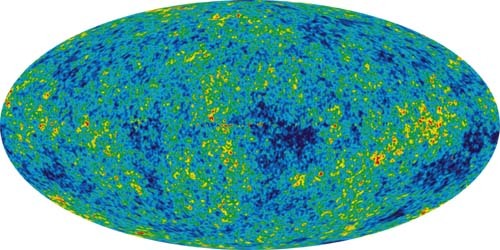 The image shows "The Cosmic Microwave Background temperature fluctuations from the 5-year Wilkinson Microwave Anisotropy Probe data seen over the full sky. The average temperature is 2.725 Kelvin (degrees above absolute zero; absolute zero is equivalent to -273.15 C or -459 F), and the colors represent the tiny temperature fluctuations, as in a weather map. Red regions are warmer and blue regions are colder by about 0.0002 degrees."